Glaucoma is a disease of the optic nerve, which is the part of the eye that carries the images we see from the eye to the brain. The optic nerve is made up of many nerve fibers (like an electric cable containing numerous wires). Glaucoma damages nerve fibers, which can cause blind spots and vision loss to develop. Glaucoma has to do with the pressure inside the eye, or intraocular pressure (IOP). When the clear liquid or aqueous humor—which normally flows in and out of the eye—cannot drain properly, pressure builds up in the eye. The resulting increase in IOP can damage the optic nerve. There are two main types of glaucoma. The most common form of glaucoma is primary open-angle glaucoma, where the aqueous fluid that normally circulates in the front portion of the eye is blocked from flowing back out of the eye through a tiny drainage system. This causes the pressure inside your eye to increase, which can damage the optic nerve and lead to vision loss. Most people who develop primary open-angle glaucoma notice no symptoms until their vision is impaired. In angle-closure glaucoma, the iris (colored part of the eye) may drape over and completely close off the drainage angle, abruptly blocking the flow of aqueous fluid, leading to increased IOP or optic nerve damage. In acute angle-closure glaucoma attack, there is a sudden increase in IOP due to the buildup of aqueous fluid. Since this condition is considered an emergency because optic nerve damage and vision loss can occur within hours of the problem, it must be treated immediately. Unfortunately, individuals at risk of developing angle closure glaucoma have few or no symptoms prior to the attack. Symptoms can include nausea, vomiting, seeing haloes around light, severe eye or brow pain, redness of the eye, decreasing or blurred vision, and headache. Risk factors include increasing age, Asian heritage, and far sightedness (hyperopia). People who are at risk for developing angle-closure glaucoma should have laser iridotomy. Many common medications, including over-the-counter decongestants and sleeping pills can exacerbate angle-closure and should be avoided until the laser iridotomy procedure is completed. Even people with "normal" IOP can experience vision loss from glaucoma. This condition is called normal tension glaucoma. In this type of glaucoma, the optic nerve is damaged even though the IOP is considered normal. Normal tension glaucoma is not well understood, but we do know that lowering IOP has been shown to slow progression of this form of glaucoma. 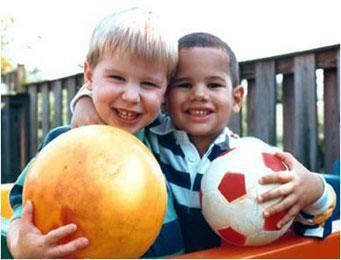 Childhood glaucoma is rare, and starts in infancy, childhood, or adolescence. Like primary open-angle glaucoma, there are few, if any, symptoms in the early stage. Blindness can result if it is left untreated. Like most types of glaucoma, this type of glaucoma may run in families. Your ophthalmologist may tell you that you are at risk for glaucoma if you have one or more risk factors, including elevated IOP, a family history of glaucoma, a particular ethnic background, advanced age, or certain optic nerve conditions. Regular examinations with your ophthalmologist are important if you are at risk for this condition. 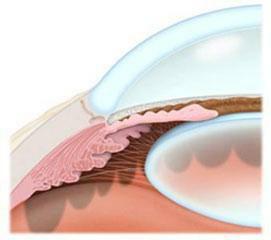 Secondary glaucoma is glaucoma that results from another eye condition or disease. For example, someone who has had an eye injury, someone who is on long-term steroid therapy, or someone who has a tumor may develop secondary glaucoma. Glaucoma can cause blindness if it is left untreated. It is estimated that only about half of the three million Americans who have glaucoma a even aware that they have this condition. When glaucoma develops, usually you don’t have any early symptoms and the disease progresses slowly. In this way, glaucoma can steal your sight very gradually and permanently. Fortunately, early detection and treatment with glaucoma eyedrops, glaucoma surgery—or both—can help to preserve your vision. During ALT surgery, a laser makes tiny, evenly spaced burns in the trabecular meshwork which stimulates the drain to function more efficiently. With SLT, a laser is used at different frequencies, allowing it to work at very low levels. 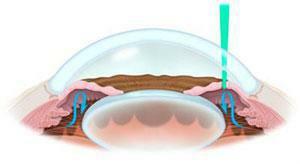 SLT treats specific cells and leaves the mesh-like drainage canals surrounding the iris intact. Sometimes, laser trabeculoplasty can also be used as a first line of treatment for patients who are unwilling or unable to use glaucoma eyedrops. 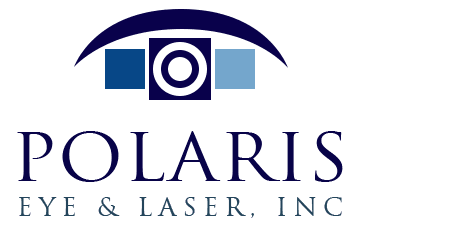 Laser iridotomy is recommended for treating patients with closed-angle glaucoma and people who are at risk for developing angle-closure glaucoma. Your eye will be numbed with eye drops prior to the laser treatment. A laser creates a small hole about the size of a pinhead through the top part of the iris to improve the flow of aqueous fluid to the drainage angle. This hole is hidden from view by the upper eyelid. The procedure will only take a few minutes and this procedure is available on an outpatient basis in our office at your convenience. When laser iridotomy is unable to stop an acute closed-angle glaucoma attack, or is not possible for other reasons, a peripheral iridectomy may be performed. A small piece of the iris is removed in the operating room, giving the aqueous fluid access to the drainage angle again. Because most cases of closed-angle glaucoma can be treated with glaucoma medications and laser iridotomy, peripheral iridectomy is rarely necessary. 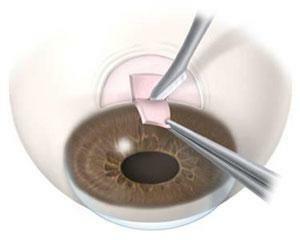 In trabeculectomy, a small flap is made in the sclera (the outer white coating of your eye). A filtration bleb, or reservoir, is created under the conjunctiva—the thin, translucent membrane that covers the white part of your eye. Once created, the bleb looks like a blister on the white part of the eye above the iris. The aqueous humor can now drain through the flap made in the sclera and collect in the bleb, where the fluid will be absorbed into blood vessels. Although regular follow-up visits with your doctor are still necessary, many patients no longer need to use glaucoma eyedrops after the surgery. 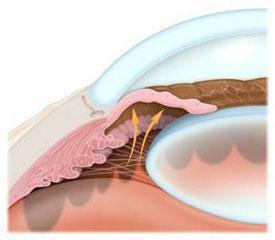 If the new drainage channel closes or too much fluid begins to drain from the eye, additional surgery may be needed. 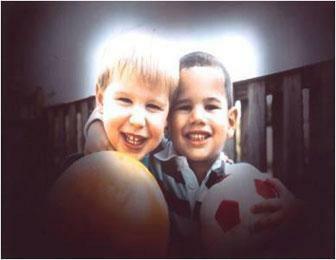 Vision loss from glaucoma usually can be prevented if detected and treated early. There are a number of ways to treat glaucoma: eye drops, laser treatment, and surgery. While some people may experience side effects from glaucoma medications or glaucoma surgery, the risks of side effects should always be balanced with the greater risk of leaving glaucoma untreated and losing vision permanently. If you have glaucoma, preserving your vision requires strong teamwork between you and your doctor. For successful treatment of this chronic condition, be sure to take your medications as prescribed and see your ophthalmologist regularly. Your best defense against glaucoma is having a regular eye exam by an ophthalmologist. Contact us for an appointment to have your eyes examined for glaucoma.